When his wife was getting at him about mowing the lawn a 36-year-old man grabbed her by the throat and threatened to kill her, Craigavon Magistrates Court heard last Wednesday. Steven Tran, Twinem Court, Portadown, admitted common assault and making a threat to kill on July 16 this year. He was given 180 hours community service. 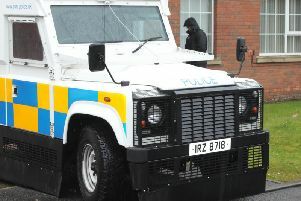 The court heard that police went to an address in Craigavon and spoke to the injured party who said she had an argument with her husband, the defendant. He had put his hands around her throat and made a threat to kill her saying ‘if I die you die’. The injured party was visibly upset and crying. Tran admitted putting his hands around her throat but denied attempting to strangle her. He also denied hitting her on the side of the head and said he had tapped her on the head with his finger. A barrister representing the defendant said he worked full time and hoped for reconciliation with his wife and family. District Judge, Mrs Bernie Kelly, said that in the probation report the defendant had shown a significant degree of insight of not only the impact on his wife but also the impact on their children. But, she added, domestic violence was a very serious matter and the court took a very serious view. “Your wife going on at you about mowing the lawn is not an excuse to hit her,” she told the defendant. The judge said the matter was so serious she would deal with it by a community based disposal.